"What's with the bags of pee in the freezer?" asked the hubster yesterday morning. Normally, I ignore all questions and comments short of "I ate the last of your Honey Nut Cheerios" or "Oops, I knocked your hair straightener into to the toilet" during Sunday morning internet time. See, Sunday morning is the only time I have to drink my three cups of coffee and spend uninterrupted time catching up on reading Perez Hilton. I debated ignoring his question. I mean, pee in the freezer trumps eating the last of my Honey Nut Cheerios but doesn't quite rise to the level of knocking my straightener into the toilet. But curiosity got the better of me. I mean really, what man casually inquires about pee in the freezer? You'd think that'd be a cause of concern. Like perhaps, the hubster would have called me when he saw the alleged pee in the freezer. But nope, the man casually toasted his two blueberry Eggos, got his glass of milk, grabbed the Sunday paper, and in the midst of relaxedly eating his second Eggo, finally thought it important enough to inquire about the pee. "So, where in the freezer is this pee?" I asked, knowing I'd never quite recapture the Sunday morning coffee-Perez Hilton reverie. "In Ziplocs on the shelf in the freezer door," he said offhandedly. "Want a waffle? I'm toasting another for myself," he said, easily moving on. I stared at him for a good three minutes, trying to figure out the male mind. I imagine it went something like this: Hungry. Must have Waffle. Open Freezer. Notice "Pee." Ignore "Pee" upon discovering waffles. Eat Waffle. Remember "Pee." Mention to Wife. I shook my head in disbelief, followed him in the kitchen and peered into the freezer. "This?" I asked, holding up a frozen bag. "Yup, that," he said. "That's chicken stock," I said. "Oh, well it looks like pee," he said. I give up. The only positive thing that came out of this exchange was a reminder that I had these lovely bags of homemade chicken stock sitting in my freezer. See, a few weeks ago, I thought it wise to make a giant pot of stock instead of making actual food for the week. Needless to say, I ate a lot of ramen that week. But somehow, the thought of all that perfect stock in my freezer made the sodium-laced kick to my innards almost tolerable. And so, it was decided. I was going to cook with stock. My initial reaction was to make soup but I've been eating a lot of soup lately. Note aforementioned ramen comment. No, this meal had to be more substantial. It had to involve rice. And maybe some veggies because the whole eat more veggies plan wasn't going all that well. Oh, and hopefully it'd be a meal that involved delicious leftovers because the last couple of days of lackluster lunches had made me feel like a lawyer who loathed lunch. Enter chicken cacciatore, a one pot wonder of chicken and veggies, cooked up in a delicious sauce that would make any rice (or pasta) proud. And my homemade stock? Well clearly that would just make my cacciatore even better. And so, I diced and stirred and marveled at the wonder of frozen bags of tricolor peppers (thanks, Safeway!). And while my delicious meal simmered, I reorganized the freezer and put the remaining bags of stock in the back because come next Sunday, I refuse to let the perfectness of coffee and Perez Hilton be ruined by "pee." PS: The crazy kids at Marx Food are at it again, inviting winners of last year's challenges to a grand Ridiculously Delicious Challenge. My winning pho with chile sauce has earned me a spot! Each contestant picks three items from their goodie list and answers the question, "What ridiculously delicious thing would you do with them if you won?" I pick the kobe beef burgers, salmon, and Bourbon vanilla beans. Because rumor has it, my parents are coming to visit. And since they still like telling the story about how I couldn't even boil rice when I was younger, I'm going to have to bring out the culinary muscle. I'm thinking an appetizer of kobe burgers served kebab style on a bed of fresh herbs and served with a spicy, yogurt raita, salmon biryani, and a cardamom laced vanilla kheer (rice pudding) for dessert might encourage them to give up on the burnt rice story. At least for a day or so. Add approximately 1/2 cup of flour to shallow dish. Season with salt and pepper. 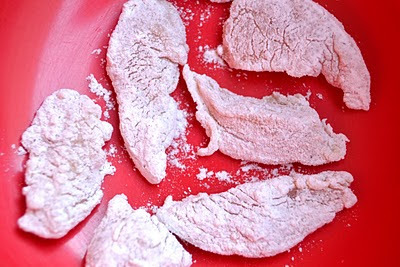 Bread chicken strips. Heat 2-4 tbs. oil in a pot pot and brown the floured chicken on all sides. Remove from heat. Heat more oil in the same pot saute diced onions until translucent. 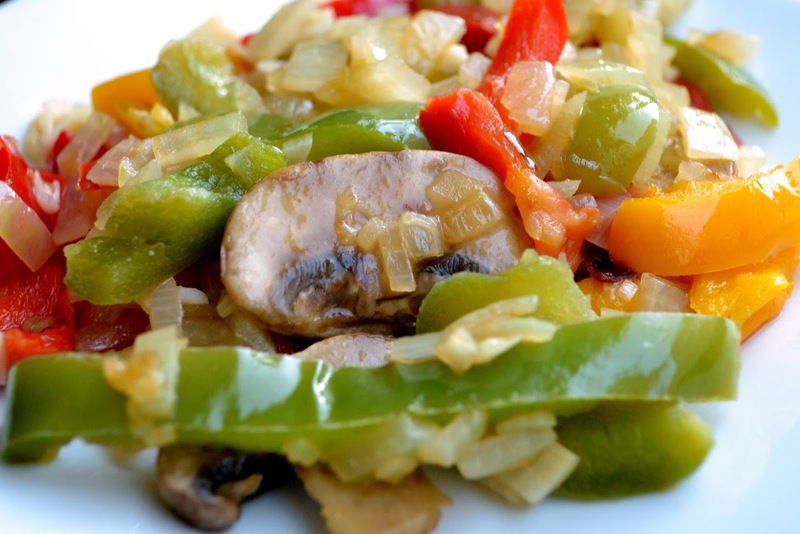 Once onions are translucent, add garlic, peppers and mushrooms* and cook for 2-3 minutes. Add chicken to the vegetable mixture. Add tomatoes and stock. Turn heat to medium-low and cook for 20-30 minutes. Add spices, including salt and pepper to taste, and cook for an additional 15 minutes. *This method results in vegetables which are cooked very thoroughly. If you like your vegetables to remain a bit crunchy, add them in the final 15 minutes of the cooking process. This chicken looks wonderful. I don't think i've ever had chicken cacciatore before! I should try it though. Did you get your tricolor pepper strips from trader joes? If so, how do you like them? I got them once and didn't like them at all - they were super mushy to me. But if you like them, I'm willing to give them another shot. Haha, I can't stop laughing that your husband thought chicken stock was pee! This is hysterical because I can relate. Not only to the bizarre question but to the way your hubby was able to move on in mere seconds - as though it shouldn't concern him more that there might be something very, very nasty in the freezer. Love it. I must add that I can barely find a moment to buy pre-made chicken stock, nevermind bust some out myself. You are amazing! Husbands are an odd lot, aren't they. Mine would do the same, though he probably wouldn't offer to make me a waffle. I love and adore chicken cacciatore! I think it takes rice to another level. I don't even need the chicken and veggies; just pour the sauce on rice and I'm good. with your home made pee-stock, I'd be back for seconds. The pee story is hilarious. Did he really think it was pee? I have to admidt that my husband would know immediately that it was chicken stock because I have been on a big stock kick. The chicken cacciatore looks delicious, and this is a nice quick version. Thanks for the laugh and the recipe. Oh wow! Guys say hilarious things. And look what those bags of 'pee' got you. I love Cacciatore and you better believe my Italian husband does too! Thanks for sharing this fun story and great recipe. I think there is Cacciatore in my future too, LOL! I was trying to solve the "pee" puzzle myself wondering what the heck it was, but I never thought of stock! Even tho I knew the pee had to be chicken stock, now I'm always going to think pee when I store chicken stock :) The cacciatore looks divine - and you're right - this is one time when mushy peppers work. What you're preparing for your parent's visit sounds fantastic - good luck with the challenge! I'd love some of that in my freezer! 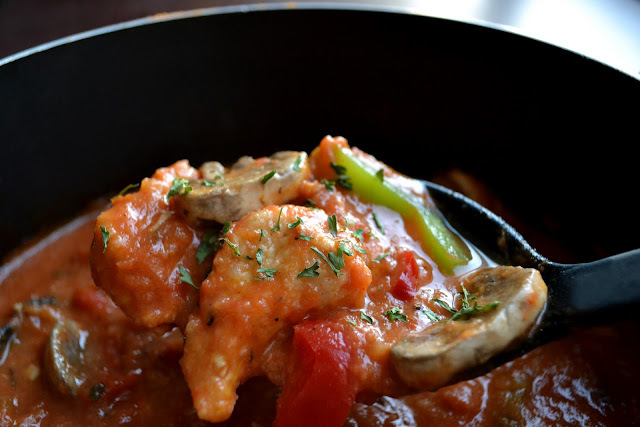 :) Your chicken cacciatore looks delicious- great comfort food! Omg, that is too funny about your hubby because mine would do the exact same thing. Almost as if having a bag of pee in the freezer isn't of big concern to him. When he does something like that, makes me want to play along and say, "where did you get those waffles? The last place I put them were under the bag of pee" just to see his next train of thought. Teehee. 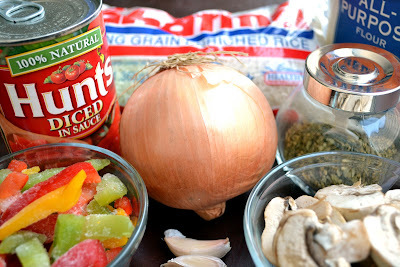 Your chicken cacciatore looks and sounds fantastic! Definite comfort food right there. Great picks for the Marx Food challenge. I've yet to try Kobe beef. u knw how much I love reading ur posts. They always crack me up. And I can so relate to that. The funny thing is my guy doesn't even realize he's being funny. No its not dry humor either! Its been so long since I made homemade stock (pee)for stock. And then I will make delicious things like this! Your Sundays sound kind of like mine do sometimes. You sure made up for it though with this scrumptious meal. I am all about easy and I like that you used chicken breast instead of the typical chicken thighs that cacciatore recipes call for. Yes. You are hilarious. We all agree! This made me smile. I love hearing the funny things that men say. I'm collecting quite a list from my sweet husband! Thanks for always making me smile with your words, photos and recipes. I hope that your Wednesday is full of joy! Ha ha ..so you made this beautiful dish with pee?? I dont knw how guys come up with this wild imagination.This cacciatore looks simple and quick..I ll take out the pee from my fridge and whip it up for dinner on weekend. Re: Just go to any desi store, u ll find curry leaves there. woe to my husband if he ever interrupted my sunday morning coffee ;) 3 cups you say? respect. Chicken stock = pee. Okay? I think he'd have waited til after breakfast for that. Love the Honey Nut Cheerios comment. I'd have a fit. Adore my man, but back off my cereal. Wonderful planning and execution my dear! Chicken stock pee and all. Made a beautiful cacciatore. Yeah...I will never ever understand men either. My roommate's boyfriend likes to sleep in the tub all night after he gets drunk. Weird. Chicken cacciatore is a definite favorite of mine. And it seems kind of like the perfect lunch. Except...I don't have any pee in the fridge. Maybe I can borrow some of yours? Oh my goodness, this looks so scrumptious and flavorful! I've always wanted to make chicken cacciatore but never got around to it. Thanks for the inspiration and the droolworthy recipe! I have got to try this soon! You crack me up!! Good heavens, I thought 'they' grow out of saying words of the sort wrt food when they grow up. Wrong again... Waffles & pee...teehee! Thank the man for the cacciatore inspiration. This sounds YUM! Must make some soon. Now for some ___ in bags, and time for chicken! Hahaha! Too funny! Very good writing and exchange between you and your husband. I loooove chicken cacciatore- you made excellent use of your chicken stock! Congrats on the challenge! My parents are the same as yours. They're astonished at what I do in the ol kitchen. Still haven't made a meal for them as I have lived in Germany for nearly 7 years. I am still thinking "what would i make them to quiet their embarrassing stories?" Everything about your meal sounds fabulous! Can't wait to read how it goes. I am sure you will have an engaging, amusing story. Have a wonderful day! Love the Cacciatore. I make a similar recipe, but no peppers. I'll have to try that! Very funny. If my husband saw anything like that, all I could expect is he telling me "I threw the weird looking stuff from the freezer" but I have to admit after hearing a lot from me now he doesn't even dare to ask any questions let alone touching them. My parents are exactly like your in that. Once when i told my mom that some of my friends praised my cooking she said i can imagine how bad cooks they themselves are ? of course that opinion has changed now. All the best for the challenge. The chicken looks delicious with all the peppers and mushrooms, very comforting indeed. I love Italian cooking and have never tried cacciatore. Looks delicious and comforting! oh the good old safeway frozen veggie section- haha totally convenient huh! this looks awesome- especially since ive been having chicken cravings lately! Oh my! This looks and sounds soooooo amazing!!! Bookmarked! Just found your blog and I love it! You're hilarious! This looks delish btw.